Our resident astronomers and science facilitators are ready to deliver the night sky directly to your classroom. Using Skype, we will deliver a 30 minute planetarium-style show for your students. Students can put their questions to our team of experts, who will be more than happy to answer. Registration is FREE, but more than this, all participating schools will be entered into a draw to win one of three telescopes up for grabs as part of our Space Week Telescope Competition! Talks will take place on a number of dates during Space Week. Dates TBC. Spaces are subject to availability. Schools will need a strong WiFi connection, a Skype account, and a screen large enough for students to be able to see the show. 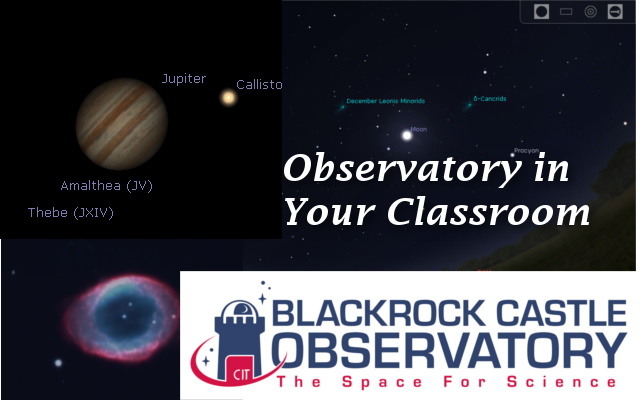 To register your school, simply email us directly at spaceweek@bco.ie, and add Observatory in Your Classroom to the subject line.